Wed, Mar 20, 2019, 12:10 pm SL Time, ColomboPage News Desk, Sri Lanka. Mar 20, Colombo: President Maithripala Sirisena yesterday (Mar 19) said that ending the caste discrimination in the North has become a more pressing problem than building national unity and reconciliation between Sinhala, Tamil and Muslim people. President Sirisena made this observation at a ceremony held Tuesday at the Bandaranaike Memorial International Conference Hall (BMICH to grant Diplomas to graduates of Sociology and Criminology of the Sri Jayewardenepura University. Addressing the gathering, the President said more effort must be made to end this conflict within the communities in the North in order to see progress in the region. The President expressing his views on the last week's report presented to the UN Human Rights Council, noted that the UN Human Rights High Commissioner had claimed that the Sri Lankan government has failed to release the lands in the north and suggested appointing a committee for the land issue. He said the High Commissioner has made the statement with a wrong understanding. He explained that 90 percent of the land in the North that was under the security forces had been released but the released land had not been given to the people and the main reason is some people in the area are attempting to distribute the land based on this caste discrimination. "The process of handing over these lands to the rightful owners is delayed due to several caste conflicts. The higher class claim the valuable lands while the lower class are left with lands with very little value" the President said. Speaking further, President Sirisena called on the academics and intellectuals to come forward to provide solutions to the social and criminal problems of the society using their knowledge. Expressing views on the criticism levelled against the decisions he has taken, the President said the academics and the intellectuals raising their voice for the country is the necessity of this era and they should not let the disrupters to suppress the actions taken for the betterment of the country. 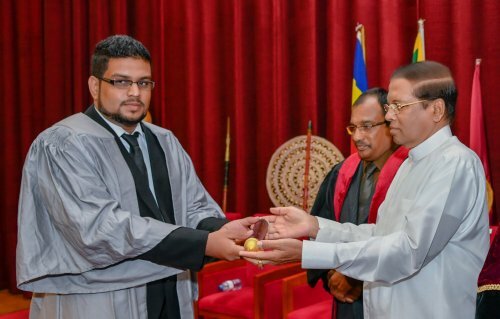 At the ceremony, 166 students who successfully completed the 2019 Sociology Diploma Course in the Department of Humanities and Social Sciences, University of Sri Jayewardenepura and the Diploma in Criminology, received their diplomas. The President symbolically presented the Diplomas to six students. Vice Chancellor of the University of Sri Jayewardenepura, Prof. Sampath Amaratunga, Dean of the Faculty of Humanities and Social Sciences Prof. GPN Chandrakumara, Prof. Mayura Samarakoon, Prof. W.S. Wijekoon and Professor Pranith Abeysundara also participated in the event.